On Nov. 7, comedian and HBO's "Last Week Tonight" host John Oliver went after its uncanny resemblance to a pyramid scheme. 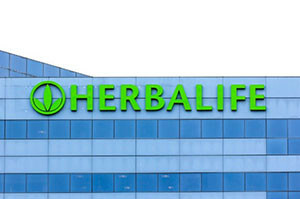 We last wrote about Herbalife Ltd. (NYSE: HLF) back on Aug. 14, 2014, when we noted that activist investor Bill Ackman "was going to deliver a 'deathblow' to the company with a presentation on HLF's predatory business model." The founder of the scam, called the "initial recruiter," sits atop the pyramid. The initial recruiter then drafts a second person. This person is required to "invest" a certain amount, which is paid to the initial recruiter. In order to make his or her money back, the second person must then, you guessed it, draft more people… and so on. This process is repeated as new recruits pay the people who recruited them, the base of the pyramid growing larger and larger. As the Federal Trade Commission (FTC) states, "they [pyramid schemers] promise consumers or investors large profits based primarily on recruiting others to join their program, not based on profits from any real investments or real sale of goods to the public." Herbalife develops, markets, and sells supplements for nutrition, weight management, sports nutrition, along with other personal care products. Current CEO Michael Johnson is poised to step down from his position in June 2017; he's to be succeeded by COO Richard Goudis. Under Johnson's 13-year leadership, HLF saw annual net sales more than quadruple to $4.5 billion as it expanded operations around the world. The announcement to transition Goudis into the CEO position came on Nov. 1, 2016 — the same day the company reported Q3 profits fell 6% to $87.7 million, or $1.01 a share. And four months earlier, Herbalife paid a $200 million settlement to federal regulators due to allegations of being a pyramid scheme. Is not UNICITY the same pyramid scheme as is Herbalife ? Why is the FTC not investigating / penalizing Unicity ? Another company with the same M.O. is Scentsy – I've been approached to sell their products but as I heard more from the recruiter, the less inclined I became. How are these companies continue to pop-up without scrutiny?